Although I am sure that there will be many to come in the future...Caiden got his first black eye. 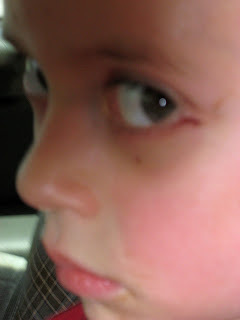 No, my beautiful, gentle and imaginative child was not fighting. Seriously, what kind of family do you think he comes from? :P He was playing and ran into the slide...yep...surely he is my son. If the cleft in his chin didn't give it away, his klutziness did! Oh, and the best part? What do you think he was playing? Well, "Toilet Party" of course. What is Toilet party you ask? Well I am glad you asked, because I had to ask too. Caiden's friend Derrick and him were going down the slide and pretending that they were swishing down the drain of a toilet. That's right a toilet. Of course, Dave and I both looked at each other smiling as Dave said..."and Caiden...you DO know what that makes you in this scenario right?" Caiden looked at him and said "Yep...poop!". Typical little boy.... I love my little poop!!!! Awww Caiden is such a little poop!! That is an AWESOME story...total Caiden too, being ok with being poop!! poor little guy. i hope it didn't hurt very much. was he at school when it happened? OUCH!!! That looks like it hurt! The rest of the story is LOL!!! Great! Got to love boys.